I find great relaxation being outdoors and having dirt under my fingernails! How the heck did this happen to me? As a kid my mom would make my sisters and I work in the yard by either picking up bags and bags of acorns or sticks, raking leaves and the worst… picking weeds. Uhg. I hated every minute of it. Now I can’t wait to get outside in the sun and work the ground. 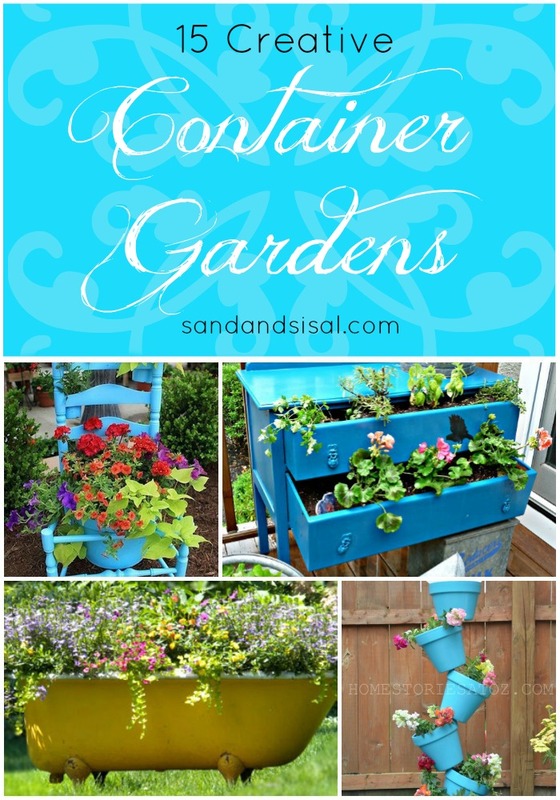 I’m a rather conventional girl when it comes to containers, but I thought it might be fun to see what you can do with a bit of imagination and make some Creative Container Gardening. Let’s take a look! 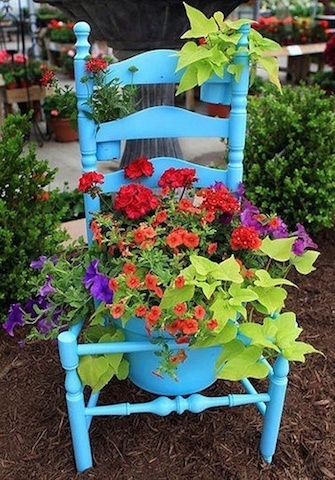 I adore this turquoise chair planter! What a stunning piece this would be in your garden. 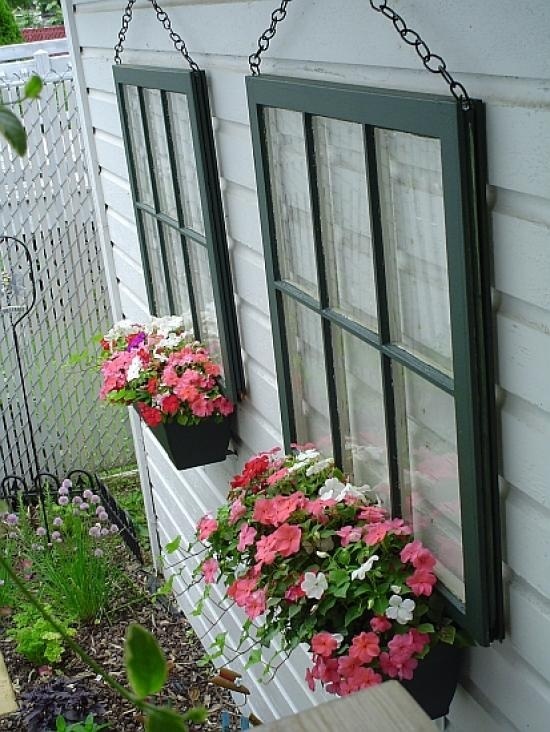 Not ready for permanent window boxes? How about these window frames with attached boxes? 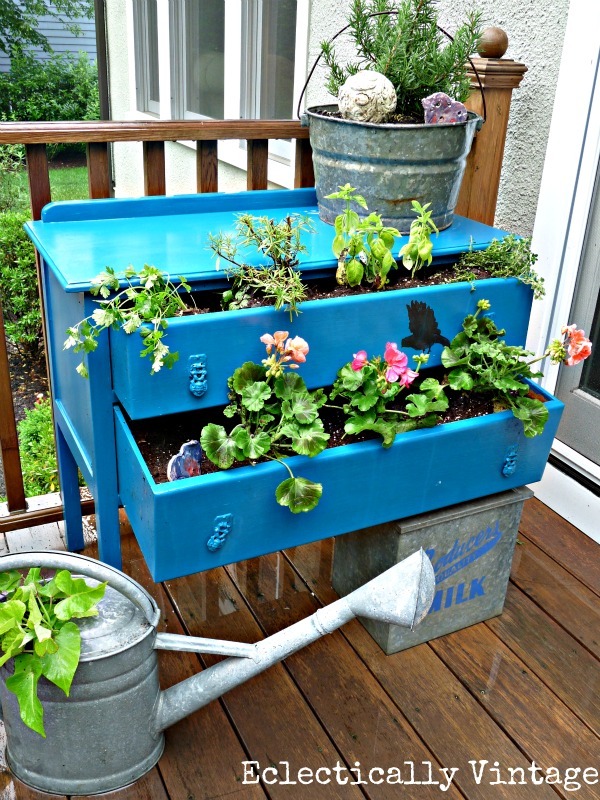 Plant herbs or flowers in galvanized containers. These rain boot planters are just adorable. 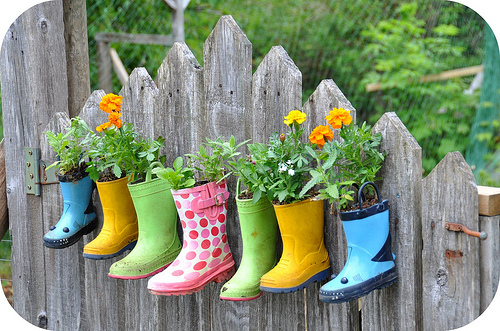 Use your children’s old rain boots for a memorable display. Get your kids involved in the garden by letting each child plant a flower in their own boots. 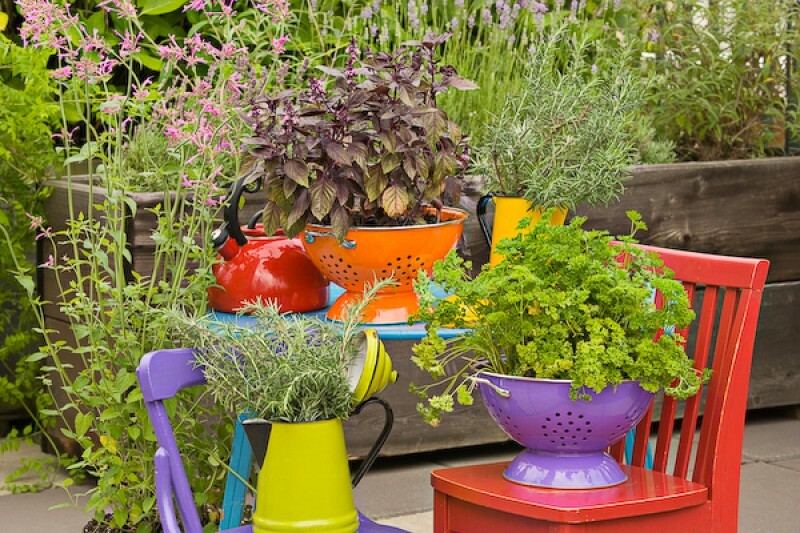 Collect thrift store colanders and give them a bright coat of spray paint, then fill them with colorful flowers or herbs. 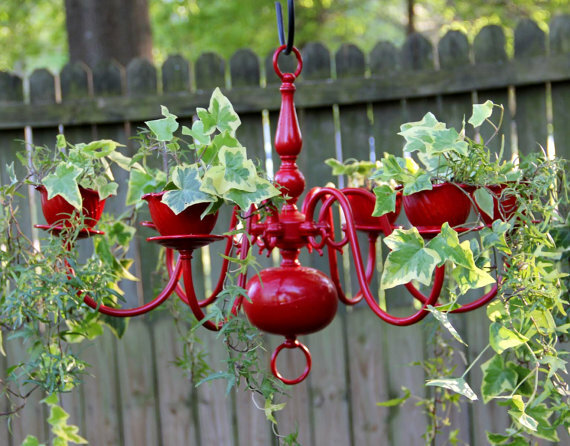 Imagine how pretty this chandelier planter would be hanging from a porch or pergola? Don’t throw away the junk… use it! 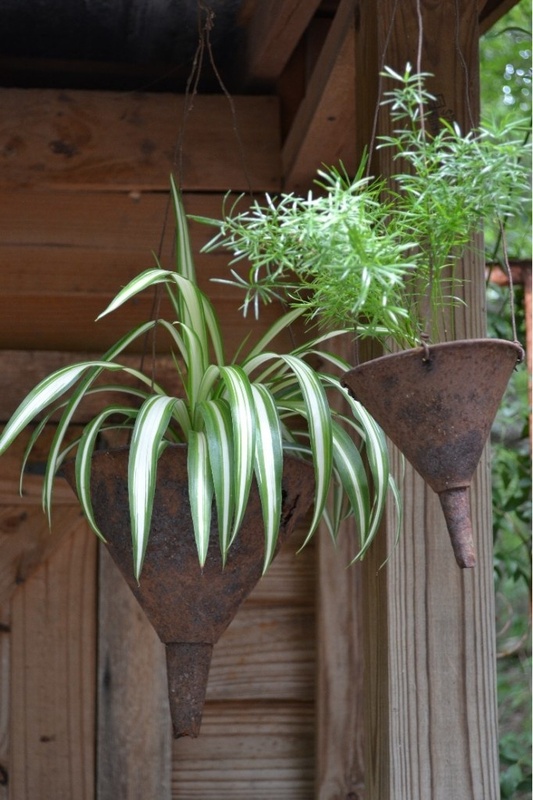 These old rusty funnel make for a very “countrified container”! Are the babies too old for their wagon? 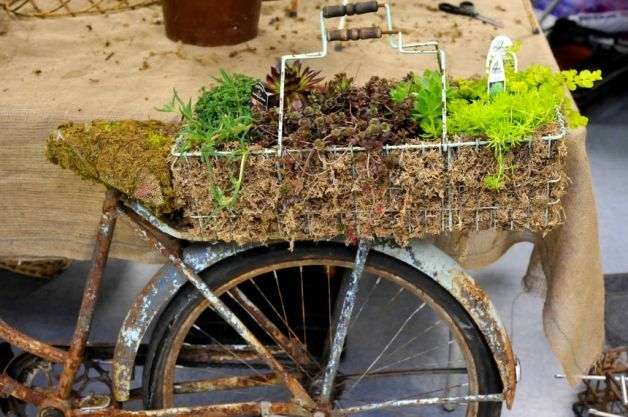 Recycle it and place it in the garden full of summer veggie plants. My friend Kelly from Eclectically Vintage took an old dresser and transformed it into a whimsical vegetable and flower bed. We all some some beautiful soup terrine that rarely gets used… right? Well take it out of your cupboard and plant some no-fuss succulents in it for an elegant and easy display. 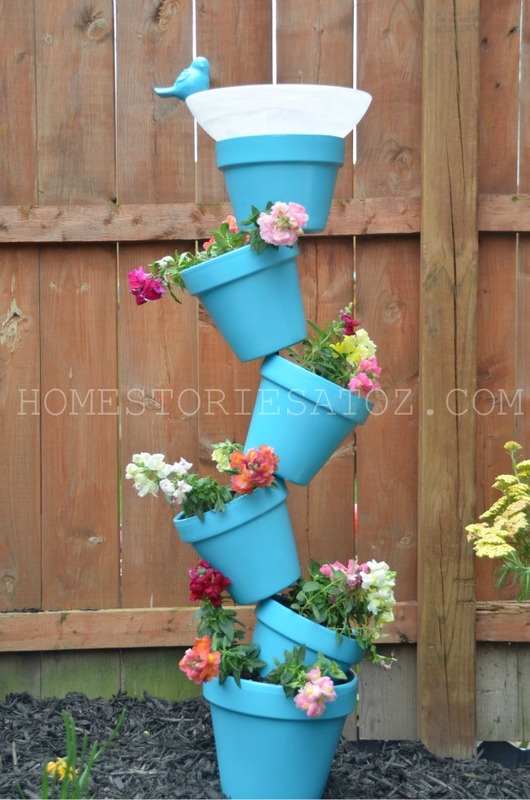 Turn your terracotta pots into something stunning! My sister Beth from Home Stories A to Z stacked painted pots in a topsy-turvy arrangement and topped it off with a cute little bird bath. Your containers can be a small as you like. 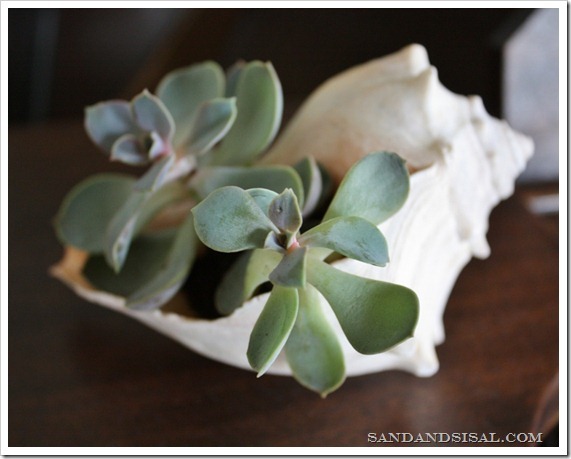 I took a whelk shell we found on the beach and planted 2 small succulents in it. Have a rusty old bike? Place it in the garden and fill the basket with greens. And these last two just made me laugh! I guess it gives a whole new meaning to planting a “Flower Bed”. I hope you enjoyed these creative containers for gardening. It just shows, you can have a beautiful garden in the most creative and strange places! 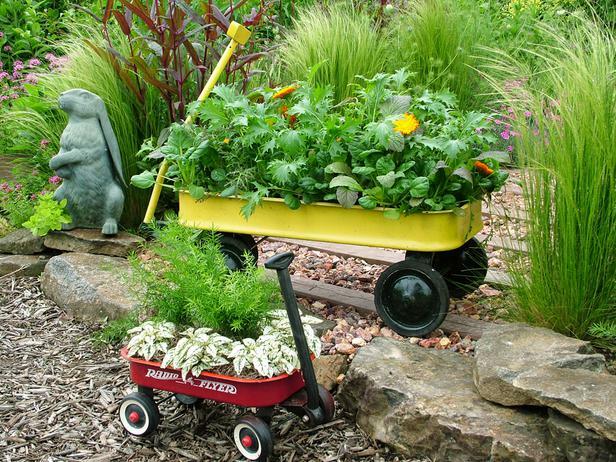 For more gardening ideas be sure to check out the Gardening Tab up top! They were all very creative, but the “flowerbed” is my favorite and the best executed one I have seen! What cute ideas! 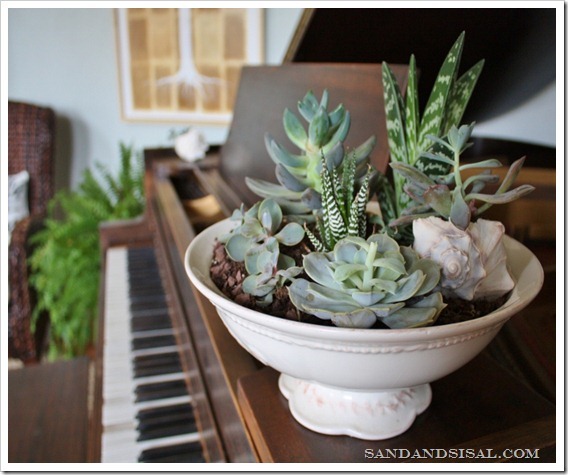 I especially love your succulent dish garden! Neat ideas, Kim! I’ve always wanted to do the one with the boots and keep them by my back door! Thanks! Each one is cuter than the next! Love that bed and bathtub!! Thanks for including my dresser planter Kim! What a fabulous roundup! 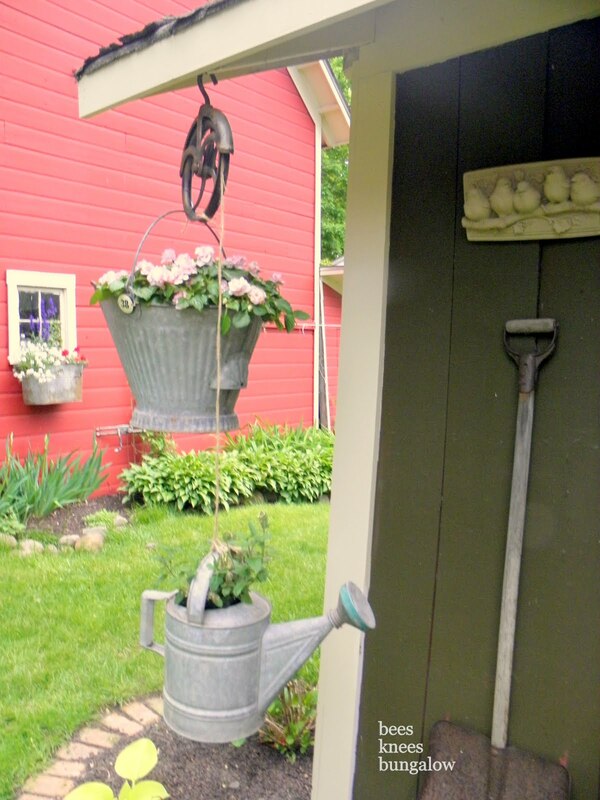 I just went to a plant sale yesterday and was already brainstorming container ideas…love love the tureen.